CD review: "Sing Christmas and the Turn of the Year"
Producer Alan Lomax is best known for his wide-ranging field recordings around the globe in the '50s and '60s. He was wont to roll into town, set up his portable tape recorder, and capture what he could of local music wherever he was. 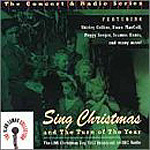 Rounder has been releasing much of this remarkable catalogue on CD; the latest in this series is a 1957 Christmas Day broadcast for the BBC. His Texas twang seems right at home in the British Isles, and Lomax, of course, had as wide a variety of Christmas music for the program  including live hookups from throughout Great Britain  as one can imagine for that time period. There are Welsh and Scottish folk groups and Trinidad calypso and American blues singers and skiffle bands and cheese shop carolers and an West African highlife band. Nor was Lomax's wide-ranging curiosity about other traditions and cultures restrained to music. Also on this program are Christmas services and pageants from different parts of England. It's a fascinating glimpse of a Christmas almost a half-century ago, one joyous and celebratory and less commercial.